Executive Production by MIKE VASQUEZ. Recorded in between at ARLYN STUDIOS, Austin, TX 1995. Mastered by GEORGE MARINO at STERLING SOUND, NYC. Front cover art by ROBERT FAIRES. Copyright 1995 Euripides Pants, all rights reserved. Originally released on SWEATBOX RECORDS. “When Sunny Gets Blue” written by Jack Segal and Marvin Fisher, and “Giant Steps” written by John Coltrane are jazz standards. The take of "Sunny" didn't quite cut the mustard to be released, and the take of "Giant Steps" appeared on our cassette demo. 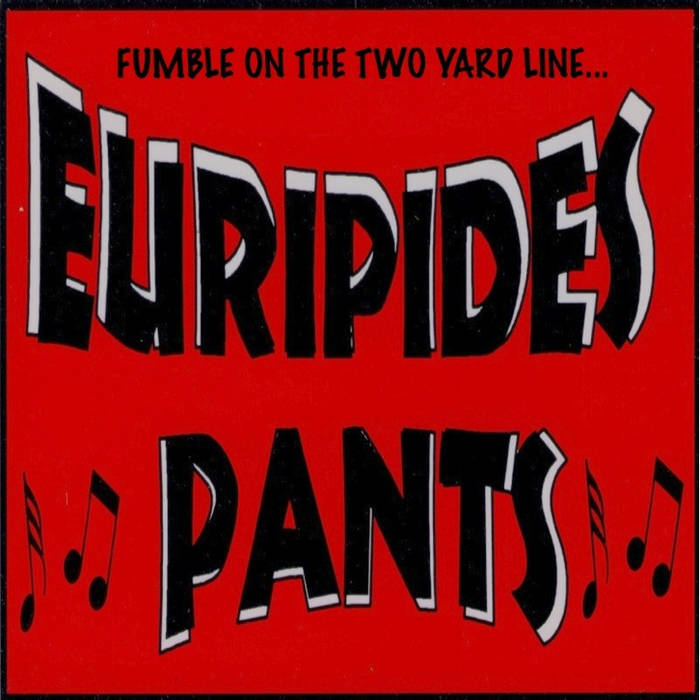 “Song for La-La”, “Skeletons”, “She Can Move” and “Raymond Burr” are Euripides Pants originals. 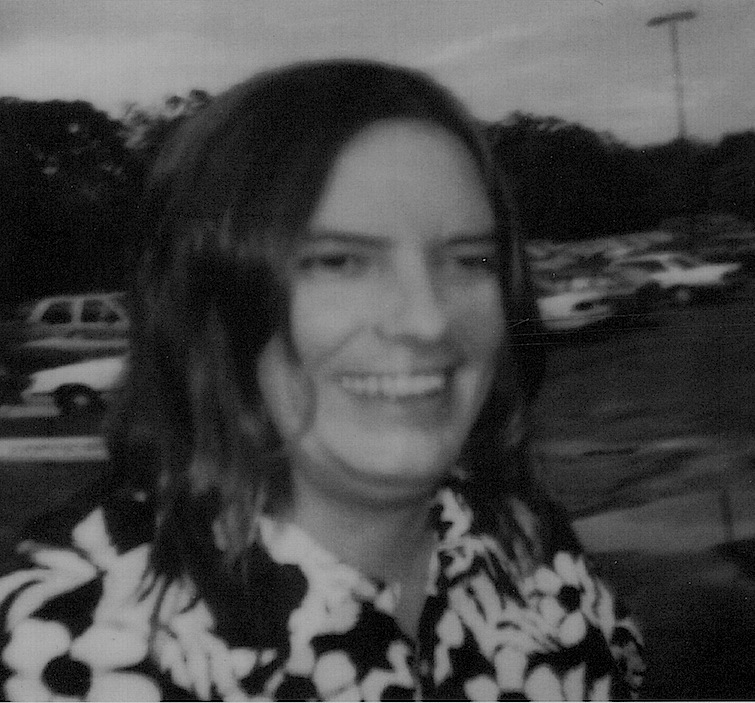 "Skeletons" is a film by George Langworthy that we did some soundtrack music for... "Song for La-La" and "She Can Move" also appear on our "Way Off Up In There" LP, but these demo versions have something about them that warranted their inclusion. Swept up off the cutting room floor, these recordings decently preserve a portion of our songs not represented on our actually good album, “Way Up Off In There”. ...I say ‘actually good’ because it was recorded at Arlyn Studio and produced by Paul Leary and Stuart Sullivan. That album is all polished up, with all our parts recorded separately and overdubs and all that good stuff (good for 1995 or 6, anyway), making it sound like perfect takes. We meant for that LP to come out. Presented here, however, is how we sounded live, clams and all. Only, we are in a studio so the sound quality is not too crappy. These takes were from sessions recorded at Sweatbox’s studio in Austin, with Mike Vasquez and Bryan Nelson...such great memories! At the end of a work day at Sweatbox, I’d get a rough mix tape to take home and listen to. Little did I know that these cassettes would end up as master tapes for this album, since the studio burnt to the ground one day with all the copies of our cd and all the master tapes of everything we made. And our stickers, damnit. So we didn't mean for this LP to turn out this way exactly, but what the hey. Talk about droppin' the ball on the two yard line. Most of the songs on this album are covers. “Slick” (Herb Alpert and John Pisano) and “Gettin’ Sentimental” (George Bassman) Mills Music Inc. ASCAP are from Herb Alpert records, and were takes not good enough to appear in our demo that we used to get gigs, but were some of the meat and potatoes of our set. We were all huge Herb Alpert and Esquivel fans. We began to record. First a cassette only demo, then a full-fledged LP, with Paul Leary producing and Stu Sullivan engineering over at Arlyn Studios in Austin. They were an impressive production team to watch, and I tried to learn as much as I could from observing them. 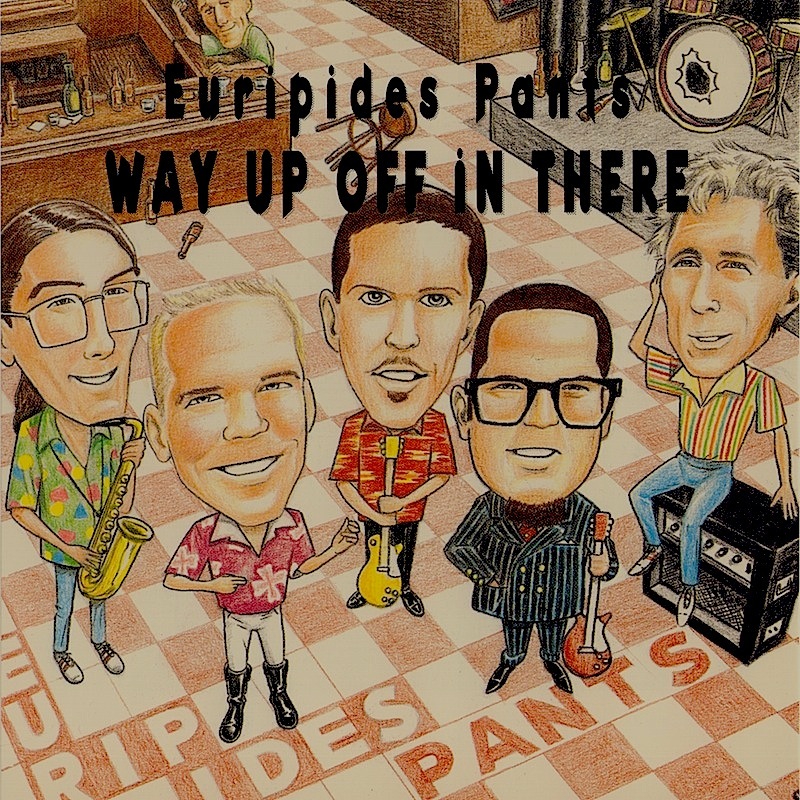 Mike Vasquez, who had owned the studio ‘Sweatbox’ that we had recorded our cassette demo at, had footed the bill for Arlyn and Leary and Sullivan, and had tried to start a ‘Sweatbox Records’ label with the Euripides Pants CD. He had something like 10,000 copies printed up and they were still mostly sitting at the studio when it burned to the ground, taking almost all of them with the blaze. by then, the band had broken up, too, so poor Mike had lost a small fortune on the failed project. I will always feel a pang of guilt over that. I’ll never forget, too, when Dave Jerden, the fairly well known Producer came by during one of our recording sessions. I guess he enjoyed the music, because at one point he took the whole band into a little room and we had a little meeting. All he wanted to know was if our band was a “dictatorship” or a “democracy”. When we told him that we were a democracy he got this pained look on his face, and told us that we were doomed and would soon break up. He got up to leave, and we begged him to stay for a second and explain himself. He said to do the research: every successful band is a dictatorship, or possibly a partnership with one guy on top. democracies are a set up for disaster when egos eventually clash with no clear cut hierarchy. They all break up. I was absolutely stunned at the revelation, have taken it to heart ever since, and repeated the story to many a music student. Naturally, he was right about Euripides Pants. In 1996, Rey was asked to join Ministry. I didn't know why, but already didn’t like them, and now I had personal reasons to be pissed--they stole my drummer! Little did I know that a few years later they would be asking me to join...and would do it for the next 5 years.